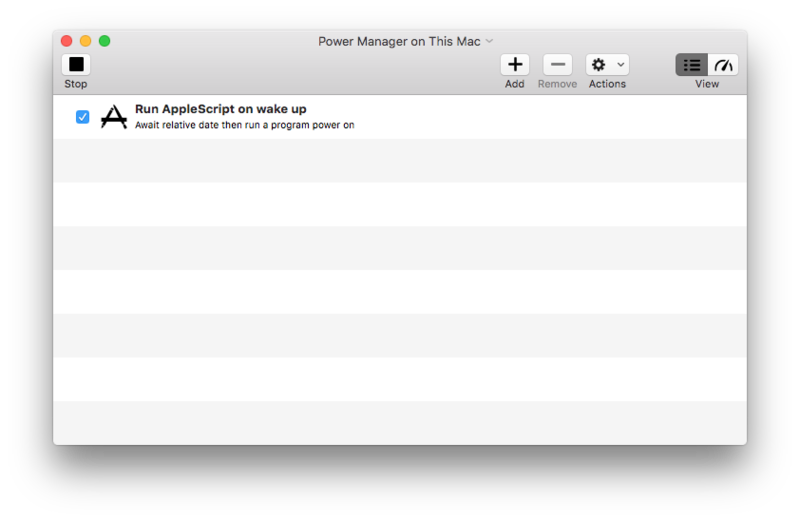 You can use Power Manager to run an AppleScript when you wake up your Mac. Running an AppleScript when your Mac wakes up can be used to automate repetitive configuration tasks, such as mounting disks, or establishing a connection to a particular wireless network. We are going to use Power Manager's trigger power on. This trigger fires whenever your Mac powers on from being asleep or from hibernation. This means you can use this event with MacBooks that are set to deep sleep. This trigger provides consistent behaviour when waking from sleep and deep sleep. Copy and paste the AppleScript above into a new document. When your Mac powers on, the trigger will fire. The event will start performing its actions. The first action asks the event to wait three seconds. This time is needed to ensure your Mac is fully woken up and ready to launch new applications. After three seconds, the second action is performed. It is this action that launches the application. By default your application will be launched as the front most user. If no-one is logged in, the application can not be launched and nothing will happen. The action launches the application stored at /Users/Shared/MyScript.app. For this event, you should save your AppleScript as an application in this location. If you need to run a process regardless of whether a user is logged in, consider using a shell script and Power Manager's action execute external. 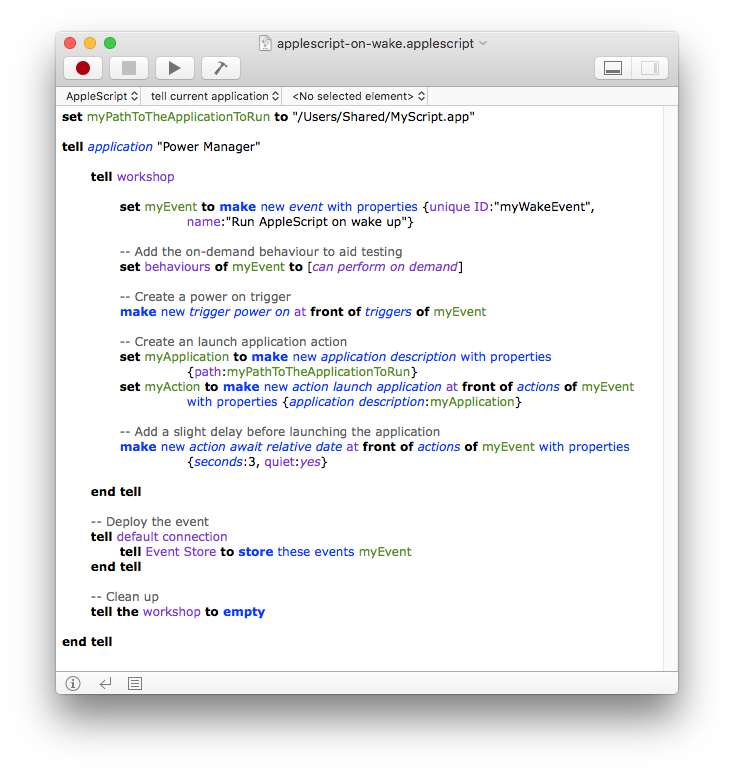 Once the above AppleScript is run, the event will be created and scheduled. Thanks to the on-demand behaviour, you can test this event without needing to put your Mac to sleep. Test this event manually by using the system menu bar or your using Power Manager Remote as a trigger. For the curious, you may like to see what happens when you set the await relative date's quiet property to no. This article was posted in AppleScript, PM4, PMPRO4, Power Manager, and Recipe and tagged AppleScript, dssw, Power Manager, power on, recipe, and wake up.